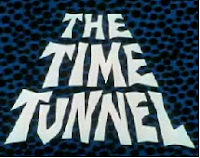 One of the ways I justify my modest TV Guide collection is to cite it as "research," that is, to take what is in reality a relaxing diversion and turn it into a scholarly enterprise. But of course there is something to it: as I've mentioned before, one can do far worse than use TV Guide to provide a snapshot of popular culture at any given time. Since I started this blog, I've been intending to take an issue from my collection every week, and just open it at random: see what's inside, whether or not there was anything important going on, and whether or not something in it wound up being pretty special. So let's take a look at this week in TV Guide from 46 years ago, the week of February 12, 1966. And since TV Guide always started the week on a Saturday, we'll do the same. 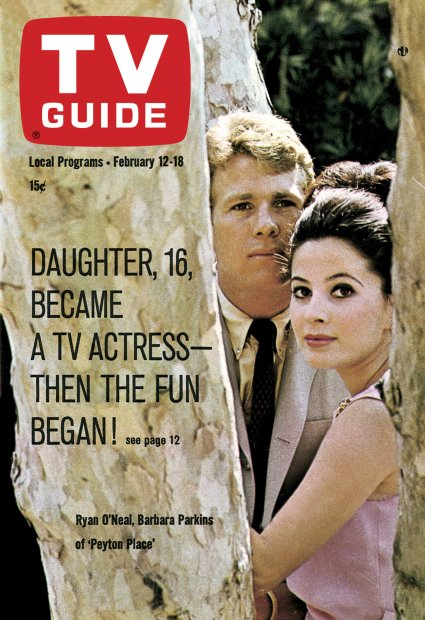 On the cover are two of the stars of Peyton Place, Ryan O' Neal and Barbara Parkins. O'Neal, of course, went on to have a pretty successful career, highlighted by his Oscar-nominated role in Love Story. Parkins was big in the late 60s and early 70s, with her starring roles in PP and Valley of the Dolls. *Apparently National Geographic wasn't extreme enough back in those days to be called "NatGeo." *Reed was said to be the second choice for the show, after Gene Hackman turned it down. Imagine it for a moment: Mike Brady hunting down the French Connection. Kinda makes you pause, doesn't it? Inside, in the program listings, there's not a whole lot to talk about. CBS Reports features "The Divorce Dilemma," wherein we learn of "one of the major social problems in the U.S." - the divorce rate having hit an unthinkable 25%. It's a bit higher now. Bob Hope has a comedy special on NBC, and CBS has "An Evening with Carol Channing." There's also a teaser for next week's TV Guide, featuring a profile of Lee Majors. "Seven years from now . . . I'll be getting an Academy Award nomination," Majors is quoted as saying. Well, he didn't - but he did go on to a long and pretty successful career in television. * The Rolling Stones and Wayne Newton appear with Ed Sullivan, and ABC's Hollywood Palace counters with Donald O'Connor and Paul Anka. *A bit of irony there, if you're looking for it. Consecutive issues of TV Guide presenting us with Ryan O'Neal and Lee Majors, the future companion and husband (respectively) of Farrah Fawcett. What, I wonder, are the odds? There's really nothing that jumps off the page though, no hockey or basketball game that everyone talked about the next day, no show that went on to set a viewing record or introduced us to a new star or caused the controversy of the season. In short, it was a perfectly ordinary week in television, the kind that gives one a snapshot of how things were, the week of February 12, 1966.